Abrams is the first Black woman in history to deliver the Democratic response for the State of the Union. Never count a Black woman out. Stacey Abrams, the Georgia Democrat whose historic run for Governor almost flipped the state blue, isn’t letting her loss in November stop her political momentum. Democrats have selected Abrams to give their State of the Union response to President Donald Trump on Tuesday night. The nationally-televised event will be closely watched in the aftermath of a disastrous and history-making government shutdown, which caused the first SOTU to be postponed by House Speaker Nancy Pelosi. While millions may tune in to watch Trump, many of those eyes will be on Abrams, which makes this moment that much more critical for her and Democrats who strategically selected Abrams for the spotlight. We spoke with Dr. Avis Jones-DeWeever, a leadership strategist and author of the award-winning book, “How Exceptional Black Women Lead,” to break down the significance of this moment. Stacey Abrams is the first Black woman in history to deliver the Democrats’ response. For the past two years, Democrats have selected white men to deliver their SOTU responses: Rep. Joe Kennedy III provided the Democratic answer to Trump in 2018, and in 2017, former Kentucky Gov. Steve Beshear, gave a folksy clapback in a diner surrounded by (mostly) white folks. But this year, Dems have decided to not to “blend in” but to stand out. “She is going to be coming right after Trump’s address and what we’re going to see is someone who in every possible way is completely, diametrically the opposite,” says Dr. Jones-DeWeever. Abrams, a Spelman and Yale Law School graduate, was elected Georgia House Minority Leader and would’ve been the first Black woman governor in U.S. history if she won in November. It signals that she is a rising star in the Democratic party. “A person is chosen to represent the party, [who] is seen to be an up and coming star,” says Dr. Jones-DeWeever of the State of the Union response. 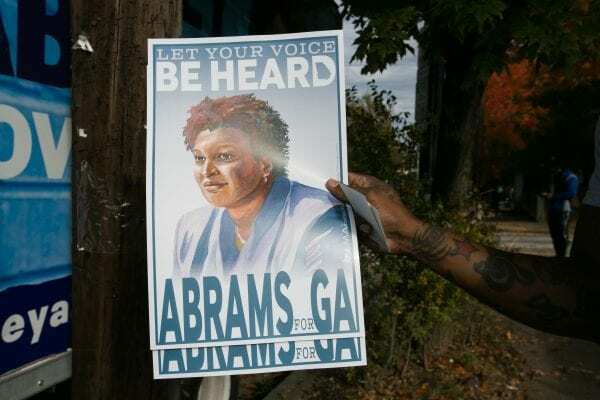 Abrams came within fewer than 55,000 votes (2.2 percentage points) of winning her election and faced well-documented voter suppression efforts, but earned new fans due to her determination to keep fighting. “Anyone who understands the context of what she was up against knows she had the toughest race in the nation, and I believe quite frankly had everything been fair she would probably be the governor of Georgia right now,” says Dr. Jones-DeWeever. Aside from her race for governor, Abrams was instrumental in helping to register tens of thousands of new voters in Georgia, many of whom were minorities. Dr. Jones-DeWeever points out that while much of the post-midterm election talk focused on Beto O’Rourke, Andrew Gillum and Stacey Abrams actually had lower margins of votes between themselves and their competition. “She was by far the person who came closest to turning Georgia blue,” says Dr. Jones-DeWeever. It shows that Democrats are acknowledging Black women are essential to their success. It’s no secret that Black women have been miracle workers, both with historical voter turnout and major election wins. Black women voters, however, don’t want to be taken for granted. A recent survey indicated that more and more Black women feel the Democratic party doesn’t represent their interests. In an interview with theGrio, House Speaker Nancy Pelosi addressed the concern. The data backs her up. Analysis from the Brookings Institute shows that two-thirds of Black women who ran for office in 2016 were elected in primarily Black districts, but were also viable in regions where Black people don’t make up the majority of residents. Black woman showed up in 2016, with 94 percent voting for Hillary Clinton, compared to 53 percent of white women who voted for Donald Trump. They also showed up to defeat Roy Moore in Alabama, with 98 percent voting for Doug Jones. “It’s important to signal to black women that we see you and we appreciate you,” says Dr. Jones-DeWeever. It could boost her entire political career to new heights. With so many eyes on Abrams and growing support from her party, her political career could skyrocket further after her speech on Tuesday. With the endorsements from Oprah Winfrey, Common, John Legend and President Barack Obama, it was hard to ignore Stacey Abrams. She even packed out college campus auditoriums of students who want to hear her speak. According to White House sources, President Trump, who enjoys throwing rallies of his own, is expected to present a more “unifying” message tomorrow. A leader like Stacey Abrams, may be able to cut through any nonsense to call Trump to the table. Despite a history of racial and partisan division in Georgia, Abrams is a skilled politician and he still knows how to appeal to a diverse coalition of voters. They’ve connected to her as a fellow Georgia citizen. What she can do at a national level may be even more tremendous. Natasha S. Alford is Deputy Editor theGrio. Follow her for news and political updates at @NatashaSAlford on Twitter and IG.